"How far would you go, how much would you sacrifice to get back what you have lost?" “The Missing” is a western themed film that is set in New Mexico during the late 1800’s. 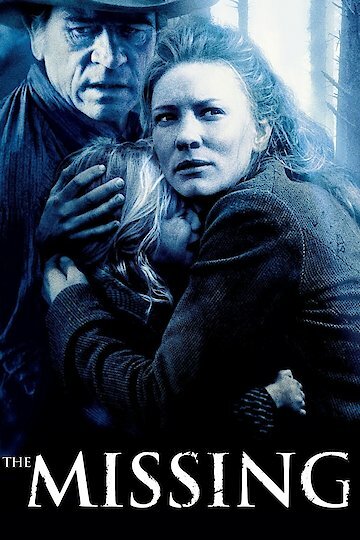 Samuel Jones (Tommy Lee Jones) returns un-invited back into his daughter Maggie Gilkeson’s (Cate Blanchett) life after years of being away. His intent is to apologize for abandoning her as a child. She initially rebuffs him but after Pesh-Chidin, a slave trading gang, kills Maggie’s boyfriend and takes her daughter, in order to sell her across the Mexican border, Maggie’s attitude changes. The U.S. Cavalry offers no aid to Maggie in getting her daughter back which forces her to rely on her hated father to track the gang down and retrieve the girl, Lily, before she is sold. Along the journey, Jones meets a Chiricahua Indian friend and his son who are also tracking Pesh-Chidin to get back the boy’s fiancé. Jones reveals to Maggie that he has been living amongst the Chiricahua Indians while he was away from her and lived a regrettable life in which he gained an unflattering nickname from the Indians. Following days of searching and traversing the vast desert, the group discovers Pesh-Chidin camped around a group of rocks. They stealthily free the women, but Jones’ Indian friend is killed in the process. The group flees the slave traders until they come to a mountain in which they decide to stand and fight. El Brujo, the gang’s leader, is able to bypass the shooting and makes it to the top of the hill where he engages in hand to hand combat with Jones. Jones saves Maggie from Brujo by tackling him off the cliff, leading to both their deaths. Maggie finally realizes that her father truly loved her after he sacrificed his own life to save her. She recovers his body from the bottom of the cliff and begins to return home with her two daughters safely by her side. The Missing is currently available to watch and stream, buy on demand at Vudu, Google Play, iTunes, YouTube VOD online.